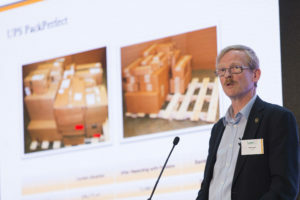 Urban delivery fleets are often considered the natural environment for electric vehicles, so it stands to reason that a logistics giant such as global parcel company UPS should be one of the pioneers of EVs in the British capital. The company got into the London plug-in game early, with its first EVs going into service in 2008. Range anxiety is a frequent hang-up for businesses operating electric vehicles. 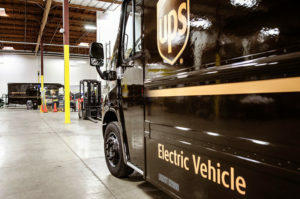 UPS’s London fleet hasn’t been affected by it in the slightest but power supply, which reared its head when the firm reached 10 EVs, has been a far bigger issue. An upgrade to the local supply bought some time and capacity but it wasn’t cheap, nor was it a permanent fix if the plug-in fleet was to expand, so the company looked for alternatives. Via the medium of various different tie-ups, including with Innovate UK – a non-departmental public body sponsored by the Department for Business, Energy and Industrial Strategy – UPS has embarked on a trial of a smart charging system, with the capacity to optimise the timing and the amount of available power based on grid loads and the fleet’s needs. 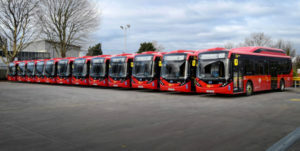 The move has allowed the firm to increase the number of electric vehicles based out of its Kentish Town depot. It currently has 52, was limited to 63 by its outgoing power supply, and can now handle a further 20, bringing the total to 72. The trucks themselves are 7.5-tonne items, converted from UPS’s existing diesel vehicles. 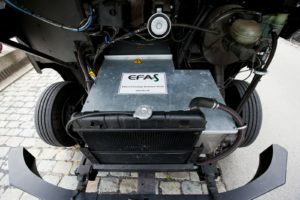 “What we’ve been doing for the past five or six years is a conversion programme in conjunction with a German company called EFA-S. We take Mercedes Vario-based distribution vehicles – that already have UPS bodies on them – but at mid-life, which is about the seven-year mark, we work with EFA-S to convert them from diesel to electric. Some of the work is done in-house at UPS and some of the work is done in Germany. We’ve done about 150 of them across Europe now and about a third of those are in Central London. Harris admits that pure electric delivery trucks don’t work in every scenario but says the firm is also working on range extenders capable of switching between internal combustion for the motorway and battery power for zero-emission travel in cities. “For most of our other locations, pure EV is not the perfect solution because [they] require a greater range than a pure EV can, at the moment, provide. To address that challenge, we are working on another technology, also with Innovate UK and in conjunction with a company called Tether, which is a British start-up, and we have developed a range extended EV. It’s just like the EFA-S conversion, but this vehicle also carries a range extender engine, which acts as a series hybrid. It’s not connected to the wheels, but it’s able to drive a generator to put more charge back into the battery during the day. This entry was posted in Uncategorized and tagged electric van, electric vehicle, EV, UPS on September 29, 2017 by Tim Cosgrove. Electric vehicle start-up Faraday Future showed off in Las Vegas on Tuesday a prototype of a vehicle set for production next year as the China-backed company strives to win credibility in the crowded sector and weather its funding challenges. But cash shortages and a recent spate of executive departures have raised questions about the company’s prospects. Faraday is funded and controlled by Chinese billionaire Jia Yueting, the chief executive officer of China’s Leshi Holdings Co Ltd, also known as LeEco (300104.SZ), which is showing its own prototype electric car, the LeSee Pro, at CES. He is also an investor in California-based Lucid Motors, a competing electric vehicle start-up attending CES this year. In late December, LeEco said it was in talks to secure 10 billion yuan ($1.4 billion) from an unidentified strategic investor. Faraday executives would not comment on the company’s financials. “We’re hoping to … convince people that we’re real, we are doing a real product, it’s not just a vaporware Batmobile to create attention, but we now have a serious product,” Sampson told reporters during a tour of Faraday’s headquarters in Gardena, California, in December. The car will come equipped with a package of sensors, including cameras, radar and lidar, to enable self-driving capability at a future date. This entry was posted in Electric Vehicles and tagged CES, CES 2017, electric cars, EV, Faraday, faraday future, FF 91, Jia Yueting on January 4, 2017 by Tim Cosgrove.